One of the worst thing for any mechanic is trying to repair your car while it’s freezing cold and your fingers hurt. If you live in a cold country and have a cold garage, it could be a really good investment to buy an electric garage heater. The car repair will get a lot easier and a lot more fun to do if you do not have to worry about the temperature while you are in your garage. In this article, you will find my best picks for the best electric garage heaters to buy in 2019. The heaters are from Amazon and can get shipped all over the world most of the times. The Fahrenheat FUH54 electric garage heater is our top pick of this review. This is because of the high efficiency and the top-quality of this heater. If you look for a high-quality heater which can heat pretty big garages, this should be your choice. There are two different power settings of either 2500 or 5000 watts, depending on how fast you want to heat your garage and the size of it. It has an inbuilt thermostat which will give you the desired temperature and you do not have to shut it off and on all the time to maintain the temperature. It has adjustable louvers to push the heat to the desired area. Ideal for all kinds of garages, basements, and workshops. A really high-quality industry heater. 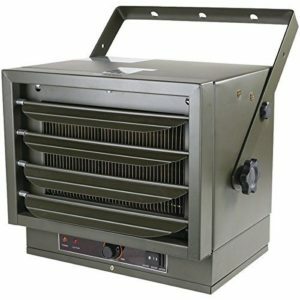 The Comfort Zone heater is also a high-quality industry heater which will do the job for you. The price is slightly higher than the Fahrenheat heater and it shows it with the crazy amount of power it has. This heater has 2 settings and has the power of a whole 7500 watts. This should definitely be your choice if you want to use it as an industrial heater or to heat a bigger garage. It is equipped with an inbuilt thermostat to do give you the desired temperature at all times. It has an enclosed motor for uses in harsh conditions. An electric garage heater for those who need to heat a bigger area with a high-quality heater. 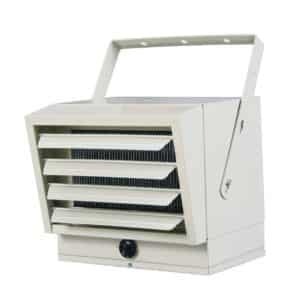 The Dr.Infrared is our best budget garage heater if you do not want to spend a lot of money on a good heater which will be enough to heat a smaller garage. It has a lot of good features and gives a lot of heat for the money. 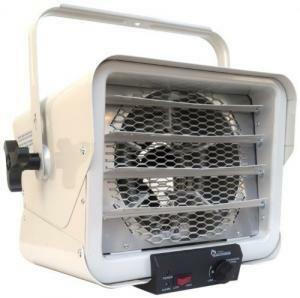 This is a really powerful heater for the price, it gives the massive 5600 watts and can heat up to 600 square feet. It is equipped with an inbuilt thermostat to hold the desired temperature in your garage. This heater requires a 220-volt plug to connect it. Make sure it’s compatible with your garage’s electrics. 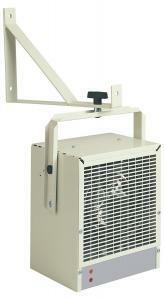 The Dr. Heater DR966 a high-performance and low-priced garage heater which has the power of 6000 watts. Perfect for industrial use or big garages. You can choose between four different heaters, depending on your needs, but this review is of the 3000/6000 watts heater. It comes with an inbuilt thermostat and has four adjustable louvers to blow the hot air where you want it. A dynamically 8-inch large fan which gives the best airflow with the lowest noise. It’s a 240-volt heater and makes sure you have the right connector or ability to wire this heater before purchase. 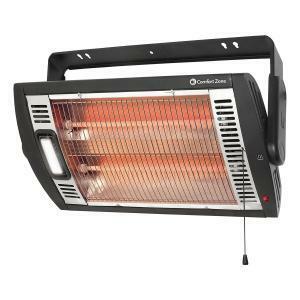 A cheap high-performance heater for mid to big sized garages. The Dimplex DGWH403 is a budget variant of the garage heaters. It’s a 4000-watt heater and it may fit small and mid-sized garages, but it may not be enough to heat up a large garage. It’s built of stainless steel. It has an automatic temperature thermostat control in the range of 45-77 degrees and uses an automatic overheat safety system to shut off the heater in case of an overheat, to minimize the fire risks. The size is 9″ Width x 14″ Height x 7-1/4″ Depth, so it’s a pretty small heater. You will get a 1-year warranty with purchase of this heater. 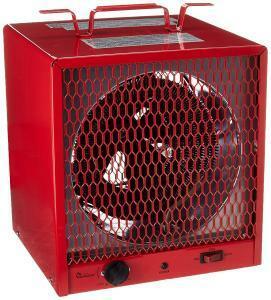 A good budget heater for a small or mid-sized garage for an daily usage with high quality. This is our last review in this review in this article. It is the Comfort Zone CZQTV5M and it’s the lowest price heater and one of Amazon’s most sold heater. It has the power of 1500 watts and is perfect for small garages. The power may be too low to heat up mid-sized and large garages. It uses a string to pull when you want to change the heat setting or the halogen light inside it and it comes with a 90 degrees vertical tilting bracket. It uses an advanced overheat protection system to minimize the risk of fire and it comes in a good looking design for any types of garages. A perfect choice if you have a small garage and do not want to spend a lot of money on an electric garage heater. How much does an electric garage heater cost to run? The cost of running an electric garage heater depends on where you live and how much you want to heat up your garage. You have to check the watt power the heater is taking and calculate it with your electric cost. The electric cost depends a lot on which country you live in so a general calculation is hard to make. The lesser watt the heater gives, the lesser will the electric bill be to use it, but the temperature will not be as high as a strong heater. Which electric garage heater should I choose for a small garage? If you have a mid-sized garage I would recommend to run it at least at 2500 watt, depending on how much you want to heat it and how cold country you live in. A good electric garage heater for this is the Fahrenheat FUH54 heater, a good and powerful garage heater for a good price. If you have a small garage and do not want to spend a lot of money on a heater, then I can recommend the Comfort Zone CZQTV5M. The price of this heater is really low and it is enough for the most usages and the quality is okay. How do I install my electric garage heater? The installing instructions are depending a bit on what heater you choose. Most of the heaters in this article is wall/roof mounted heaters. In this case, you should install it on a steady part on the wall or on the roof to make sure it will not fall down, as it may cause a person or material damages. The most electric garage heaters do only have a wire to connect into the wall socket and you should be good to run. Make sure you choose the right wall socket for your heater before purchase, different countries have different connectors. Big heaters may require more power and make sure you have the right connector installed in your garage for it. Which way is the best to install a garage heater? This could be discussed, but I would recommend to install it on the roof and have it do blow downwards. Heat raise in a room and it could be good to have the heater blow down some of the existing heat in the roof of your garage. This is of course if you are going to do a permanent installation of the garage heater. You can check this video down below if you want to see a review and how to install your electric heater to your garage. Can I choose the budget garage heater? If you have a very small garage you can choose a small garage heater. But you do normally get what you pay for and the quality and efficiency will not be as good as a more expensive heater. I have tried some of the budget heaters in small garages and I must say it has been enough for them. One of my recommendations is to get the Dimplex DGWH403 if you are looking for a cheap heater. It has good quality for the price. You can find cheaper heaters, but the quality and efficiency will not be that good. What is best, electric or propane/fuel heater? It depends on where you live and how expensive the fuel is in your country. Normally a fuel heater will be the most cost-efficient, but you do often need good ventilation to use these heaters or a heater with an external exhaust pipe. I have tried some fuel heaters without good ventilation and I do not think it’s very good for your health. After a while, you will be tired in your head caused by the exhausts and I can really recommend to either get an electric or one with an exhaust pipe if you are going to be in your garage for a very long time. Will these electric garage heaters shut off when I get my desired temperature? Many of these heaters have a thermostat inbuilt to it, so you can set the wanted temperature and let it go for how long you want. Always check the item description in the link and make sure the heater you want is equipped with a thermostat if you want to have one. I can really recommend getting one with a thermostat as it will make it a lot easier to get the desired temperature without having to start and shut it off at all the time. A fuel heater may be more cost efficient, depending on where you live, but it can cause exhaust’s in your garage which you do not want. More expensive heaters are often more cost-effective and have better durability. If you can afford it, I can really recommend you to get a good heater right away. If you have a really small garage and do not want to spend a lot of money, a good recommendation is the Dimplex DGWH403 or Comfort Zone CZQTV5M heater, but it is recommended to buy a more expensive one if you can afford it. Make sure you have the required connector plugs installed in your garage before any purchase. Reinstalling electrics in a house can be very expensive and in some cases, impossible. Different countries have different connectors, so make sure you choose one for your country. If you have tested one of the heaters in this article and want to leave your own review of one of these electric garage heaters, comment down below. If you have any car questions you are welcome to ask them at our homepage.